This was my stove-top last night. 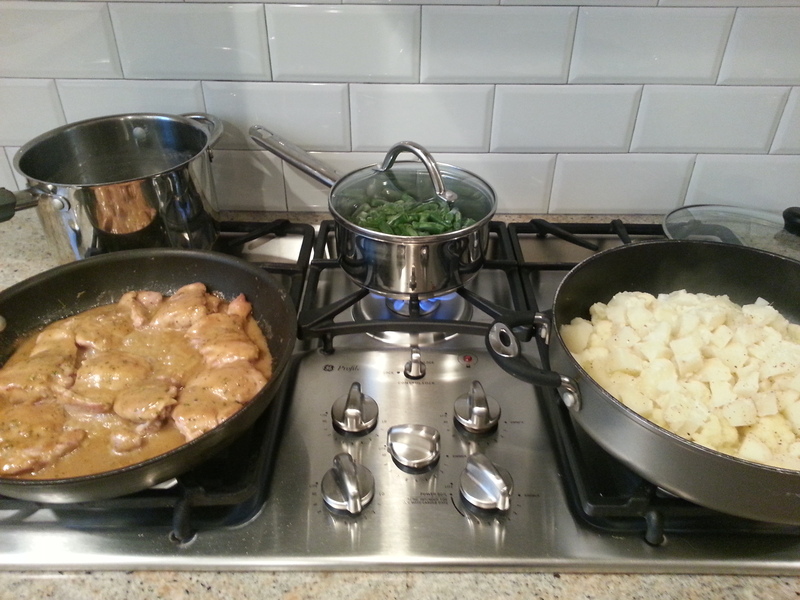 To the left the chicken was simmering away in a sauce that’s sort of a spin on honey mustard and oh-so good. I had just added the cooked potatoes to the cauliflower and they were waiting to get pureed. In the back green beans were steaming. 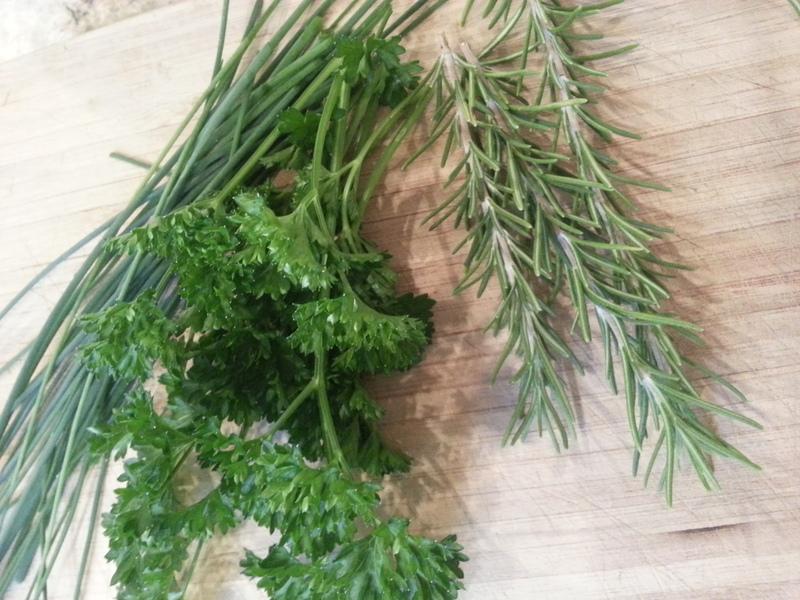 These fresh herbs came out of my garden and transformed dinner for sure. 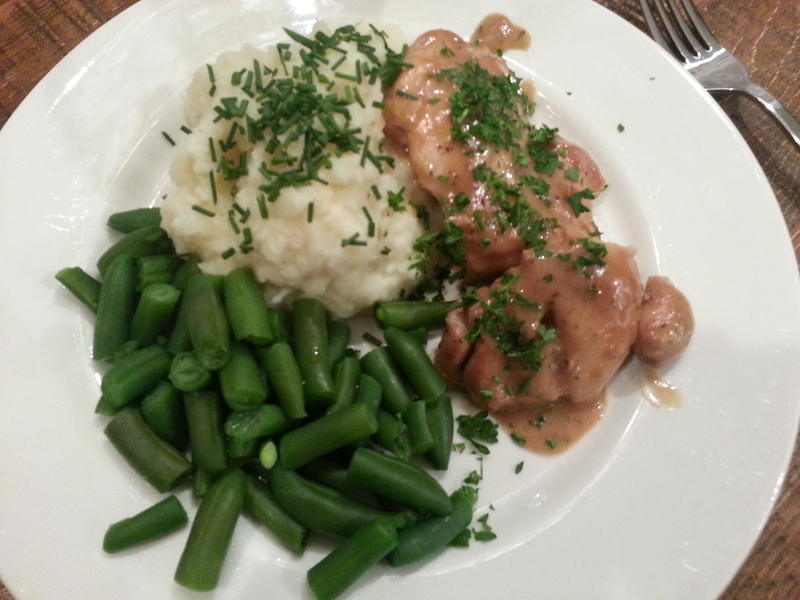 The cauliflower potato mash wouldn’t have been the same without the slight-oniony flavor of the chives. The parsley added a nice freshness to the tangy chicken and the rosemary went into the maple dijon sauce the chicken cooked in. I always forget to take pictures of the finished product (part of the reason I haven’t posted for awhile) but I did snap one pic before digging in! Heat a large skillet over med-high heat with a little EVOO. Salt and pepper the chicken thighs and cook on one side until a good sear develops. In the meantime mix the remaining ingredients in a small bowl. Flip the chicken over and add the sauce. Turn the heat down to med/med-low and cook for about 15-20 minutes, basting with the sauce from time to time. And now for the mash! Peel and dice the potatoes and place them in a pot with just enough water to cover them. Cook until fork tender, drain. Meanwhile add the cauliflower florets into a large skillet with the chicken stock. 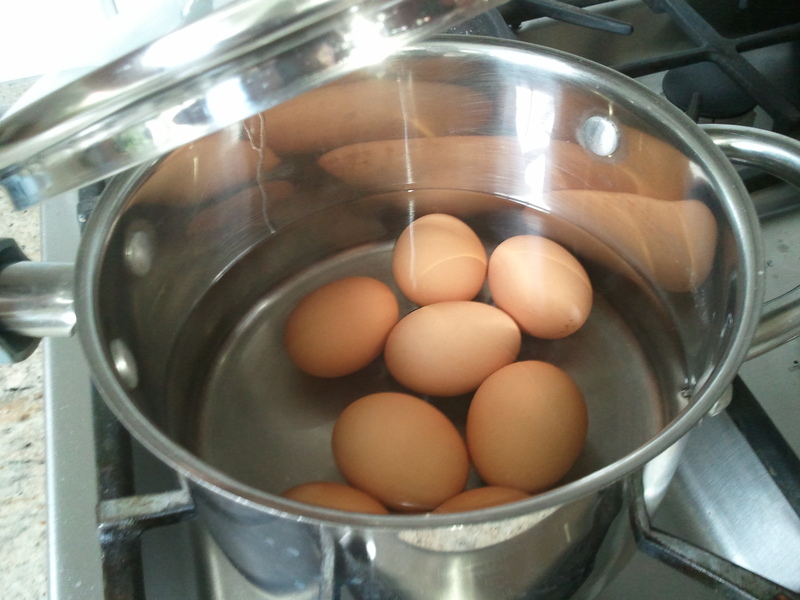 Cover and bring to boil and simmer until soft. When the cauliflower and potatoes are done add the potatoes into the skillet with the cauliflower. Add the half-n-half, salt and pepper. Using an immersion blender, blend until chunky. If mixture is too dry add a slash of chicken stock. 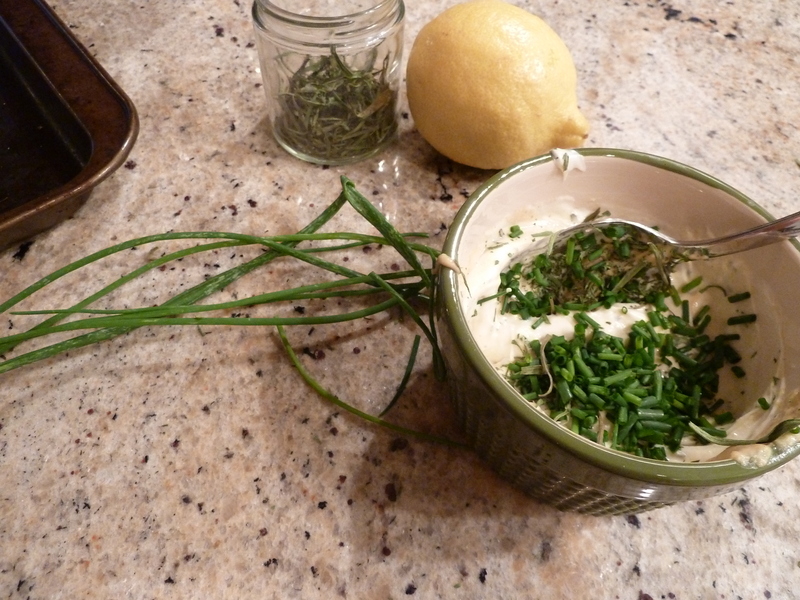 Top with chives when serving. No butter needed but it can be added if you wish! Tonight is one of those times that a recipe turned out great but there are no pictures to prove it! 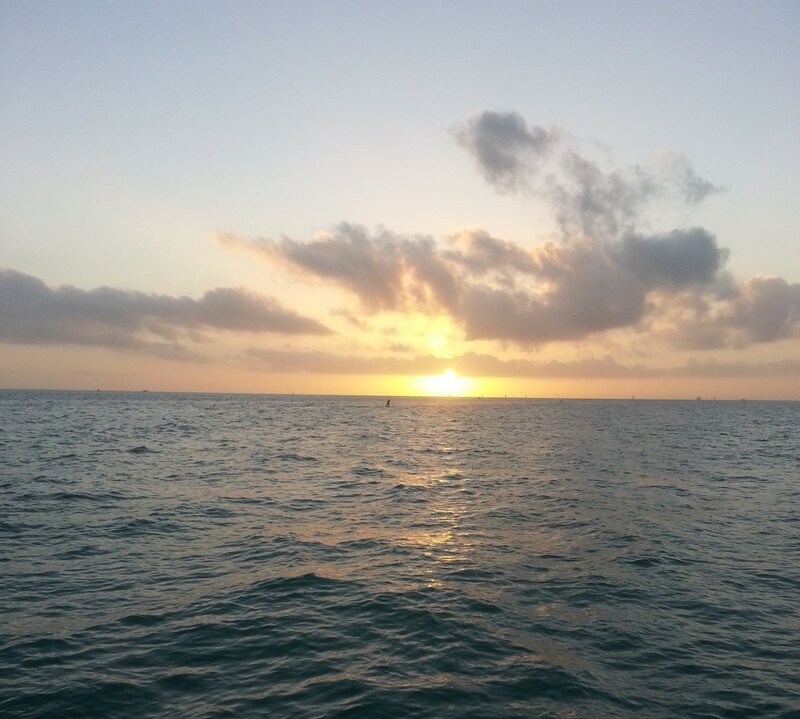 Only a couple pictures of the before. Position rack in center of oven and preheat to 400°F (I lowered the temp since it was a much smaller piece than the salmon in the original recipe). Line large rimmed baking sheet with parchment paper. Mix first 6 ingredients in small bowl. Season mustard sauce lightly with salt and generously with pepper. Place salmon, skin side down, on diagonal on prepared sheet. 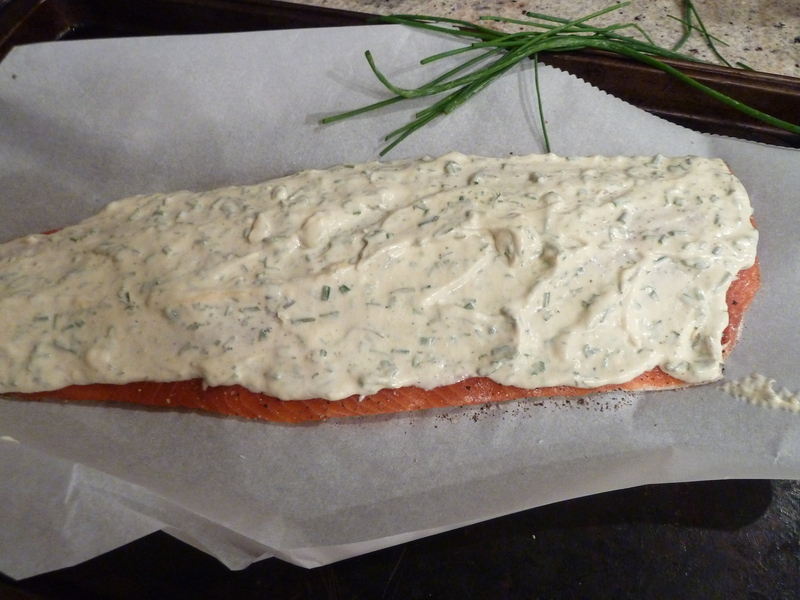 Spoon mustard sauce atop salmon, then spread over, covering completely. Sprinkle salmon generously with salt and pepper. 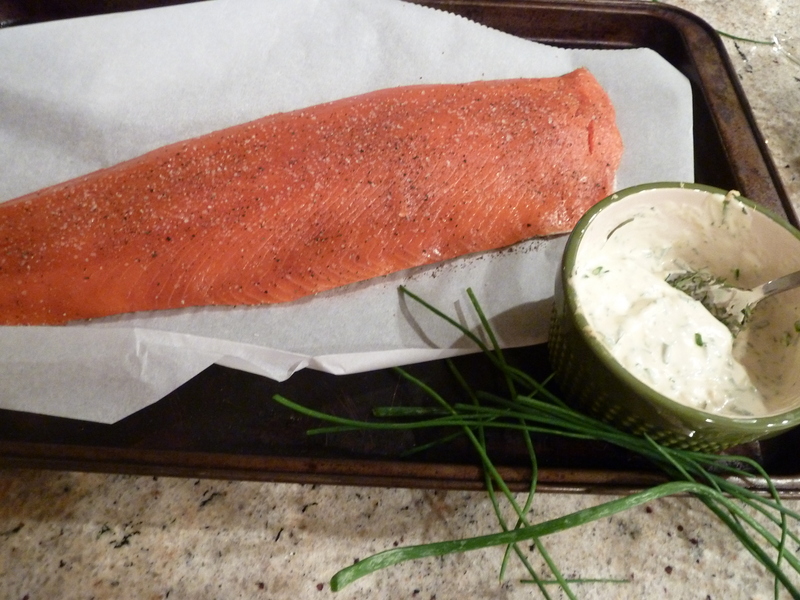 Roast just until salmon is opaque in center, about 15 minutes. Using parchment as aid, transfer salmon to platter. Cut crosswise into pieces and serve. I have been in love with Bon Appetit ever since last year when Gwyneth Paltrow was featured on the cover. I immediately subscribed and have made many recipes from Bon Appetit since then. Now I will be able to share them on my blog which is so exciting! By the way my favorite recipe from the Gwyneth Paltrow edition was the recipe for Grilled Chicken with Peach BBQ Sauce. I’ve made it multiple times and as soon as there are some good local peaches in season here I will certainly make as post about it! In the new May 2012 magazine a recipe for Curried Egg Salad caught my eye. 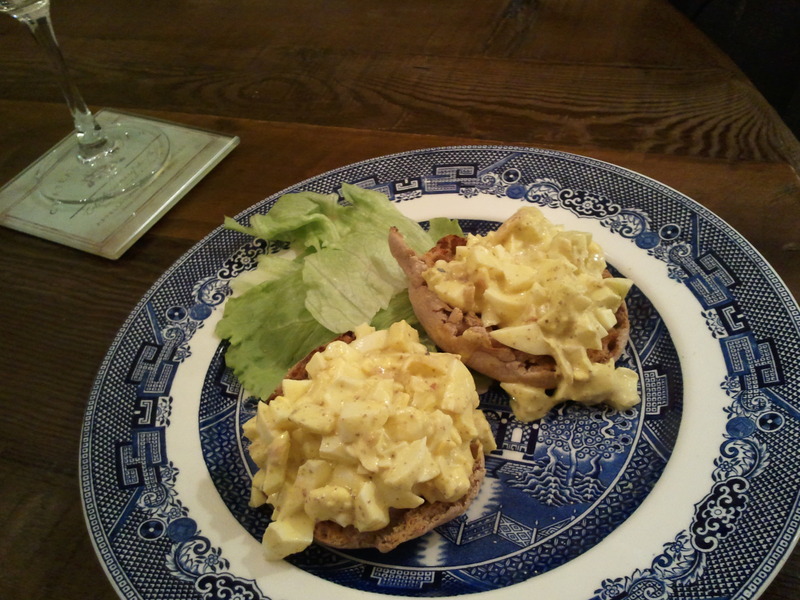 I had not made regular “old-fashioned” egg salad since I catered a friends baby shower a couple of years ago and the idea of adding curry made it sound like a perfect weekend brunch food. The recipe only called for 4 eggs and with the 2 hungry boys in my house I decided to double the recipe. The only thing I changed was that I used Vegenaise instead of mayo. I know, don’t make fun of me, I used an egg-less vegan mayo in egg salad. I prefer the taste of it to regular mayo…that’s the only good reason I can give you! 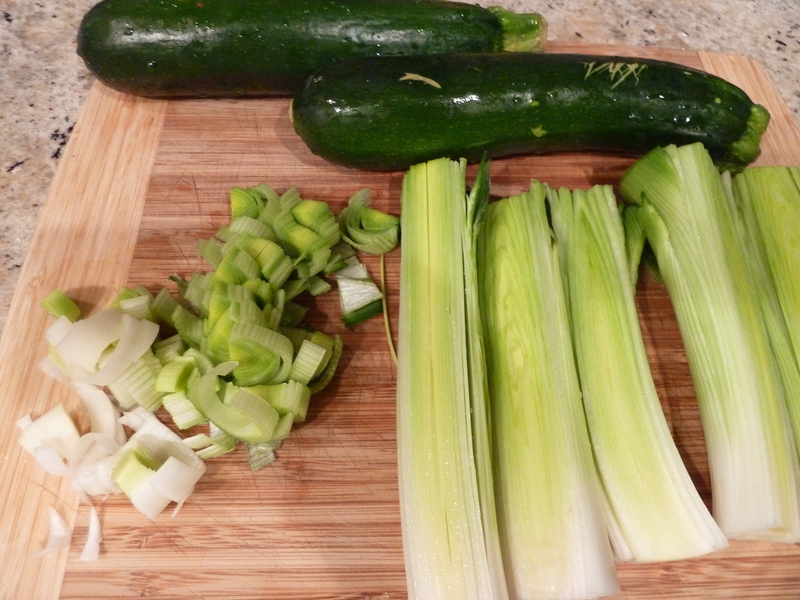 I also forgot the scallions so I had to leave those out. Whisk Vegenaise, shallot, apple cider vinegar, mustard, curry powder, and cumin in a large bowl. Fold in eggs and apple. Season with kosher salt and freshly ground pepper. I served mine on a toasted whole-wheat english muffin.